The end is near for a downtown bridge that played a supporting role in many Hollywood chase scenes down the concrete-lined Los Angeles River. Giant jackhammers reduced 220 feet of the 6th Street Bridge roadway to rubble by Feb. 6. And they were working on bringing down three massive support columns. This was according to Mary Nemick. She works for the city Public Works Department. "We had taken down the entire top of the bridge. That's completely gone as of eight this morning," she said. Crews worked through the night under floodlights to dismantle the deck. 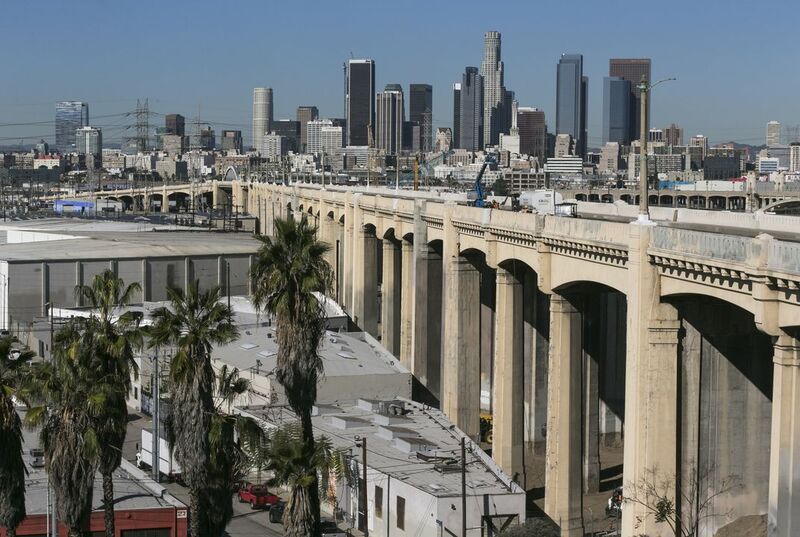 It spans the U.S. 101 freeway and the concrete-lined Los Angeles River. The bridge's concrete bottom and sides are a Hollywood favorite. The bridge has been in countless films. Think rival gang members Danny and Leo racing in "Grease" or big chases in "Terminator 2" and "Gone in 60 Seconds." A 2.5-mile section of the freeway was closed Feb. 5. A segment under the bridge was covered with 2 feet of dirt. That was to protect it from the tons of concrete that crashed down on it. Detouring drivers on other freeways didn't find too much of a problem. Delays ranged from about 15 minutes to 25 minutes, said Laurie Wonder of the California Department of Transportation. "It's actually been better than we expected. People are heeding the detour rules and heeding our warnings" to stay away from the area, she said. The plan was for the freeway to reopen just before the Super Bowl kicked off. Considered state-of-the-art when it was built in 1932, the bridge has been suffering from a chemical reaction. For decades, the chemical reaction has weakened its concrete. Eventually, the entire 3,500-foot bridge will be replaced. The new roadway has the potential to become another Hollywood backdrop. A 2019 opening has been set after $449 million in work. Arches above the roadway of the new span are designed to resemble the intermittent arcs of a stone skipping across water. What could you sculpt from snow? Why was the bridge used in so many movies? The bridge has been in so many movies because they use the bridge for chase scenes and races in the movies. "The bridge played many supporting roles in Hollywood movies." (paragraph 1). I believe it has played in these movies because the bridge is in a good location and is easy to get on to. This article was very interesting and I think that it was a good idea to take down the bridge because if it hadn't been taken down it could've broken or fallen and people could've been injured." For decades the chemical reaction has weakened it's concrete" (paragraph 10), explains why the bridge could've broken or fallen. The bridge was used in so many movies because it played in so many supporting roles in movies in a chase scene and it was very popular. The bridge's " concrete bottom and sides are a Hollywood favorite. The bridge has been in countless films. Think rival gang members Danny and Leo racing in "Grease" or big chases in "Terminator 2" and "Gone in 60 Seconds." This shows how the bridge was a setting in many popular movies and it was a really good place to make a movie. This article seemed interesting because I have been to the LA bridge before and took many pictures, and memories of it. I got so sad when it is taken down. I mean, that is like a huge tourist attraction. I don't know why they are taking it down. This surprised me because I can't believe they are taking a HUGE structure down before the Super Bowl begins. The famous LA bridge was used in so many hollywood movies because "The bridge's concrete bottom and sides are a Hollywood favorite." This means that movie directors loved how the bridge looks on screen. So does the audience. This cool and unique feature to the bridge makes it stand out against the other freeway bridges. It resembles greek architecture with its "massive support columns." The bridge has been used in so many movies because it is a LA landmark. "The bridge's concrete bottom and sides are a Hollywood favorite." Some of the movies the bridge has been featured in includes Grease and Terminator 2. This article shocked me because I had no clue the bridge was coming down. The bridge was used in so many movies because "The bridge's concrete bottom and sides are a Hollywood favorite. The bridge has been in countless films. Think rival gang members Danny and Leo racing in "Grease" or big chases in "Terminator 2" and "Gone in 60 Seconds." The sides and the bottom of the bridge were very popular, and that is why they were used in so many movies! The bridge is located in downtown Los Angeles, and Los Angeles is also a popular filming location. I enjoyed this article and I think it is crazy how they are spending $449 on this bridge. The bridge was used in so many movies because it was in the heart of downtown LA. The bridge has a view of the LA river, the high rises, and other buildings that make up the unique city of Los Angeles. " This bridge's concrete bottom and sides are a Hollywood favorite," but why is this? The answer is simple, the bridge's view of the rest of the city of LA and the plain buildings below the iconic bridge, and the concrete bottom and sides give the large structure a reputation in Hollywood because when people watch movies they want to follow a main plot, but also include their own imagination and curiosity of the surroundings of the main characters in their favorite movies. Giving the bridge a unique advantage over similar bridges in different areas. I enjoyed reading this article because I learned that the 6th street bridge was being torn down. It was the perfect backdrop for the Hollywood scene. I think because of the height and the structure. A huge bridge is coming down! But at the same time I think it would be really dangerous since its Luke the highway! It's sad to think a bridge with so much history is being taken down. The Bridge was used in many movies because hollywood likes how it is made of concrete and how the sides look. "A Bridge's concrete bottom and sides are a hollywoods favorite." This was a really interesting article. I didn't know that the bridge was going to be put down. I am looking forward to see the next bridge that they build.